Back to work after a week of Ignite means a load of e-mail and calls to return. Yet after a full day it almost looks done, and I can look back at Ignite. During the last week I had the opportunity to attend quite a few sessions. In roughly 5 days I have been brought up to speed on what Microsoft will be doing the upcoming year regarding productivity. Together with three colleagues we attended a variety of sessions. The following is a short recap of the most remarkable updates I encountered and the highlights of the week. The first day there where two announcements that caught my attention: Announcing Feature Pack 1 for SharePoint Server 2016—cloud-born and future-proof and Major OneDrive updates at Ignite 2016 include SharePoint Online sync preview. The first feature pack for SharePoint 2016 marks a new way of updates for an SharePoint installation. This feature pack contains several components that are currently only available in Office 365. Bringing some of the cloud stuff to a custom installation sounds pretty interesting and having more hybrid options sounds like a good thing. And finally there seems to be a decent update to the OneDrive Client. While the next gen sync client has been around for a while there finally will be support for SharePoint Libraries. If you want to play around with it just download the preview sync client. It also has been announced that placeholders will be coming back so it looks like OneDrive might actually be getting some love.. The Microsoft Graph has been around for a while and I had the change to play around with it quite few times. I even have the change to present on it at the TechDays today and tomorrow. Yet against all odds Microsoft announced that the Graph will support hybrid scenarios. Somewhere in time the upcoming months the Microsoft Graph will offer support for Exchange related calls. It will require to have a hybrid Exchange installation. Having hybrid support and a single endpoint will most likely make it easier to work data and provide meaningful insights of that data. Though it is still unclear on what needs to be done to set it up correctly it all looks promising. There also has been an announcement that SharePoint objects can be called from the Microsoft Graph. Having support for lists / webs does make sense though it is a pretty basic first release. It still is just as easy to swap the Graph Token for a valid SharePoint one and just do REST calls. I hope future releases will soon provide more options and make it easier to work with all SharePoint Objects. The new SharePoint Framework also got a little bit of love. While it has been available for almost a month. MSIgnite was the first conference since then. I must say that it was impressive to see the amount of efforts they already put into it. There have been three drops already! Also the fact that the web parts are running directly in the page rather than an iFrame is pretty awesome. Having to learn a bunch of new tools might looks scary at first though. 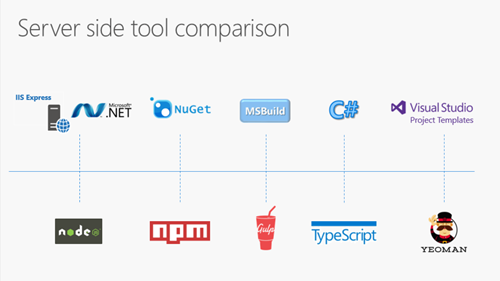 In the end learning to work with the modern webstack should not be that hard; tools as yeoman, gulp and npm are easy enough to just dive into. Everything has it quirks but just start. During the session there was however a nice slide about all this new tech. The Microsoft groups are becoming more and more mature. With announcements to combine groups with yammer, or merging a team site. Groups are becoming better and better. Having the option to share groups with external team members allows for easier sharing of information. Skype meet now for groups also sounds promising. Having the option to call everyone from the group into a meeting does sound as something that might come in handy.What is going to be interesting to see is how the groups will be aligned with team sites. Collaborating in team sites still has it’s place in organizations and having specific lists or libraries sounds good. During the week there where thirteen different sessions about groups. Most of the content available was about driving adoption or changes in groups not about the extensibility. The last major topic that I tried to follow some sessions on was about Flow and Power Apps. Power Apps will be available as a web form thus filling the void InfoPath currently leaves. Flow does look like a need workflow option for the complete Office 365 stack. I wonder how long it takes for Flow to become mature enough to replace SharePoint Designer Workflows but the demo’s looked promising. As far as Power Apps goes the announcement to have some control about the lifespan of an app makes it looks promising as well. As usual the MSIgnite was not all just work, the party was awesome! Coolest part however was to go with a bunch of colleagues and have the opportunity to brainstorm about side projects. Lots of energy and great new things are coming!